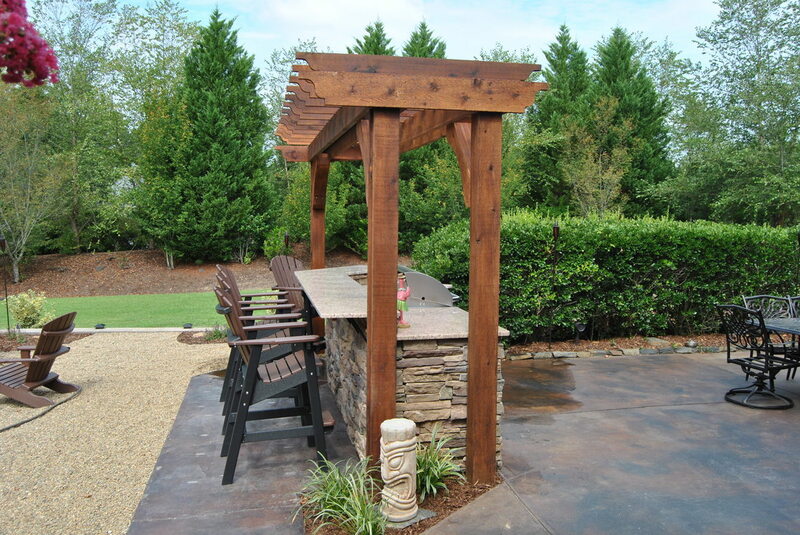 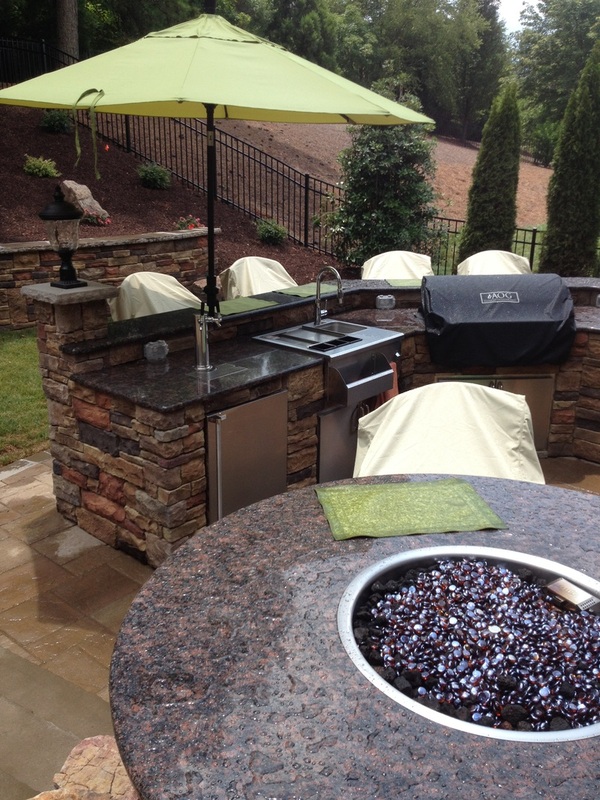 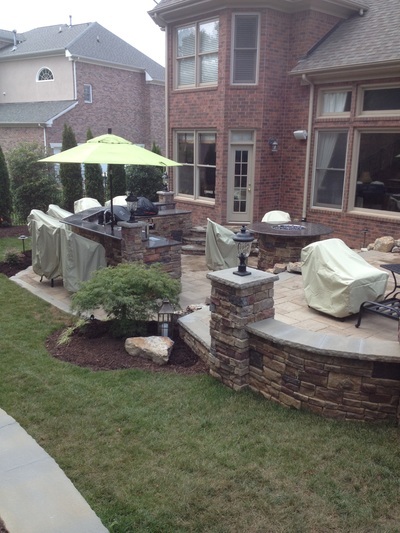 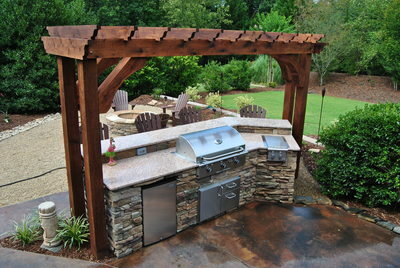 All of these outdoor kitchen islands were designed and built by our main company, Fine Edge Landscape Design. 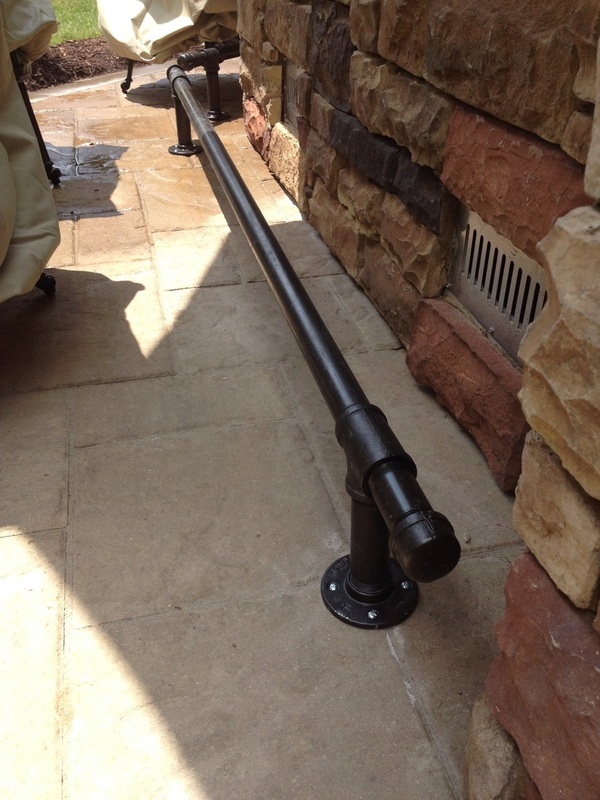 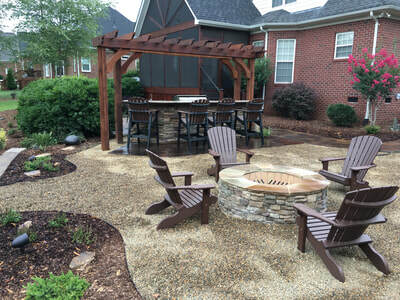 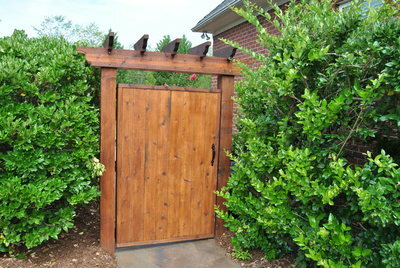 Fine Edge has been in business since 1992 and specializes in custom residential outdoor living areas. 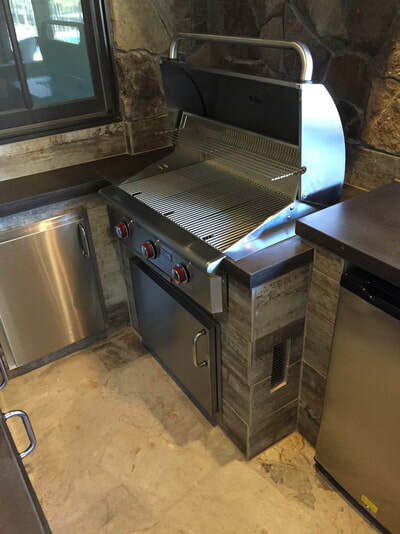 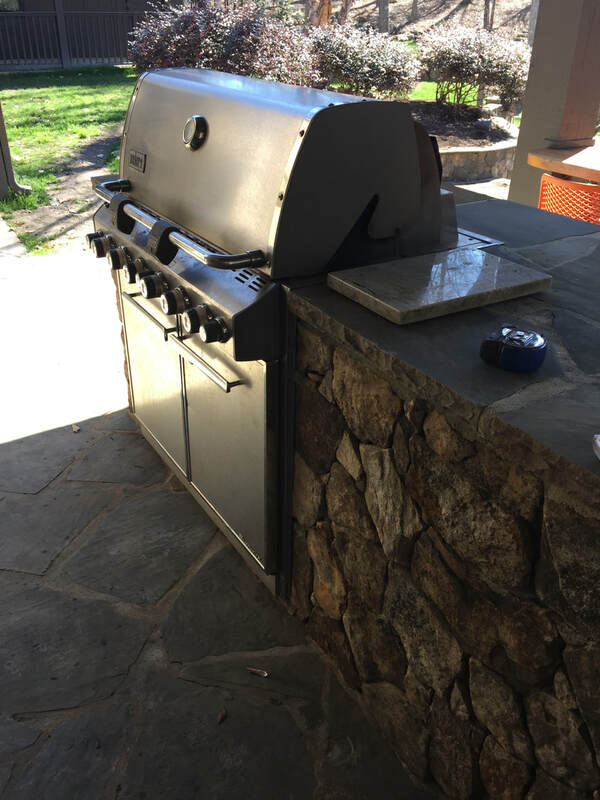 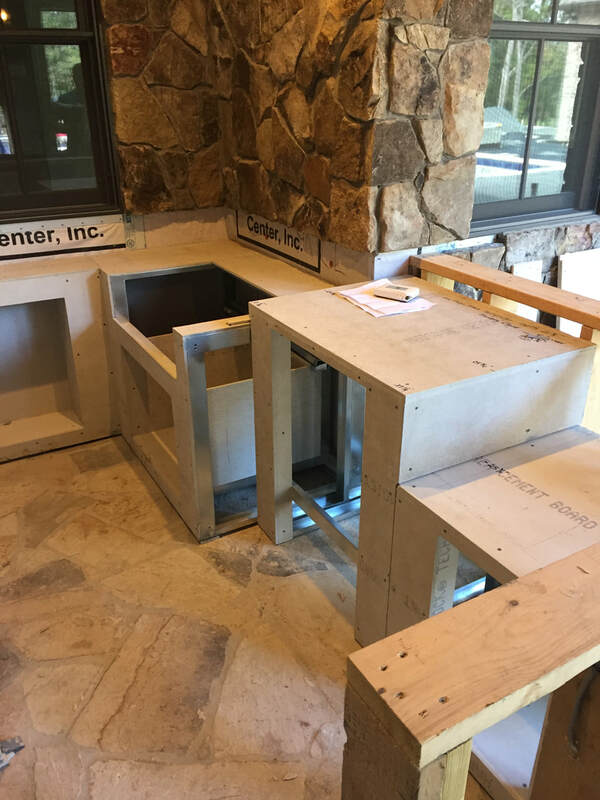 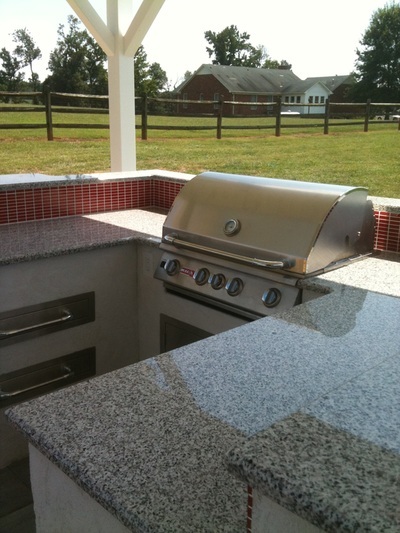 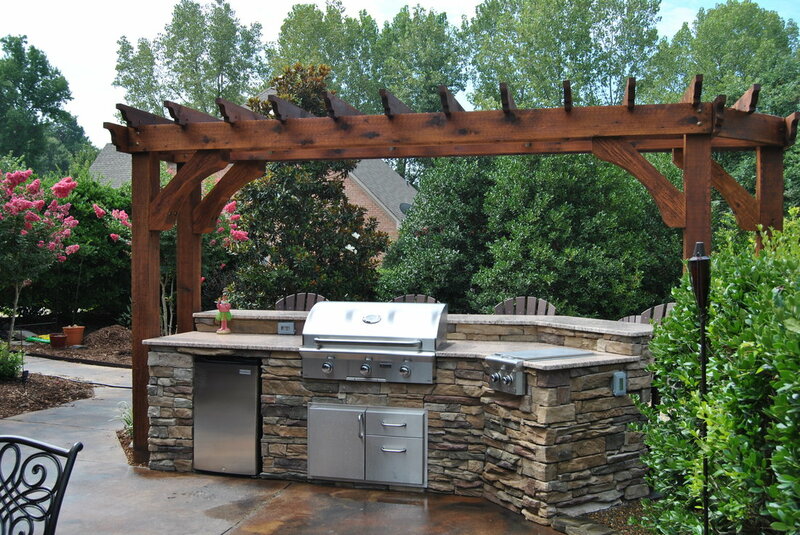 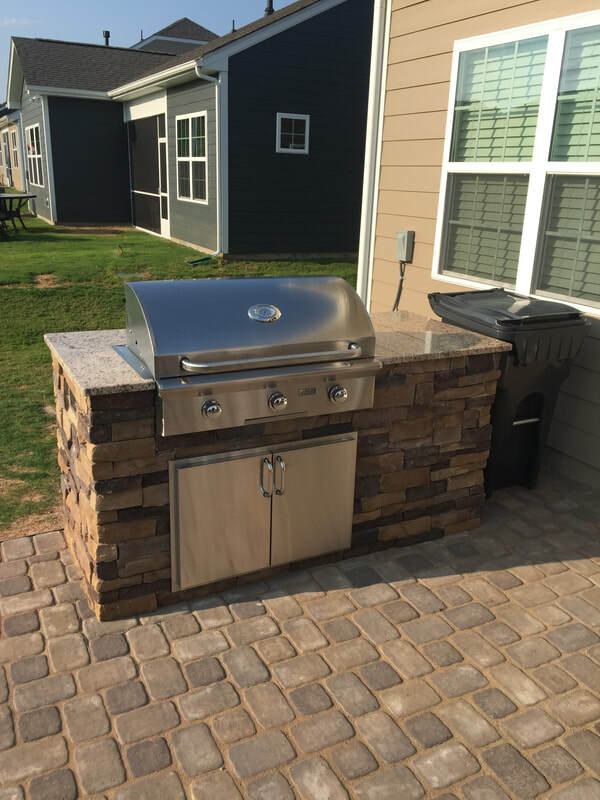 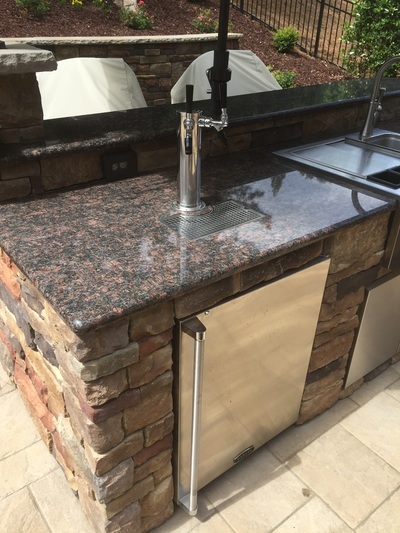 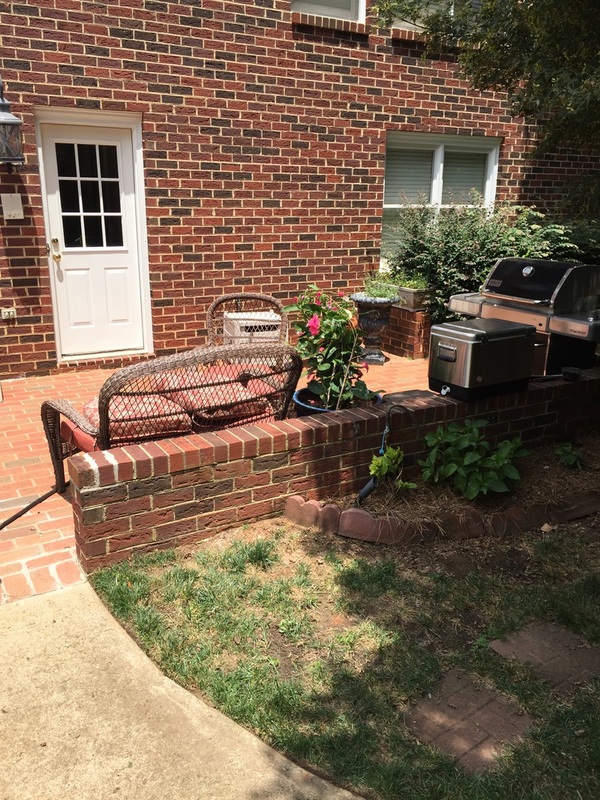 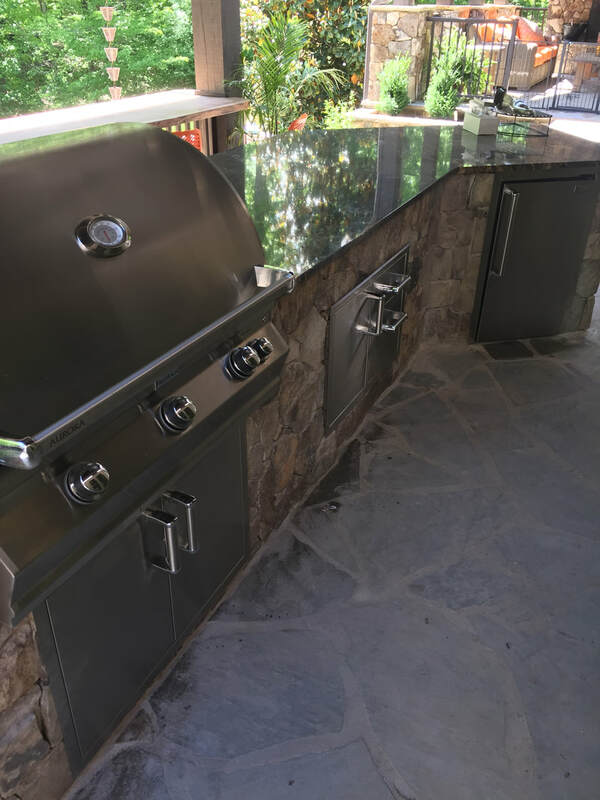 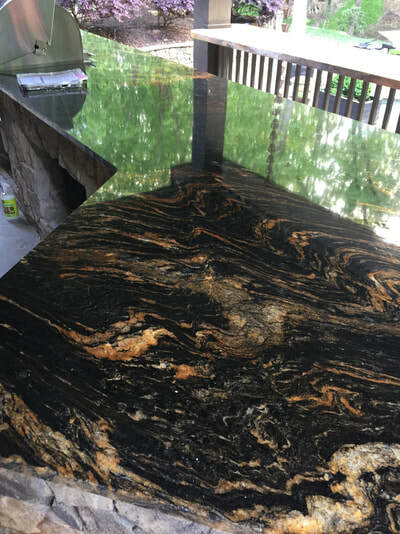 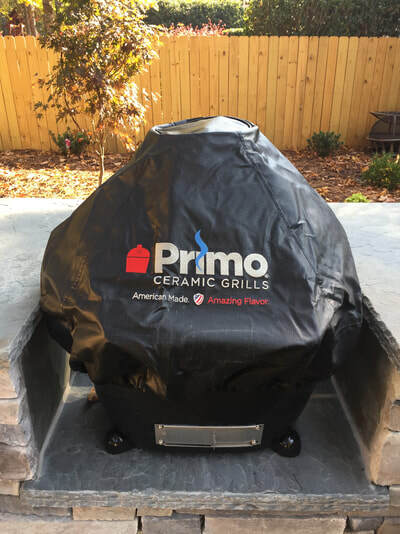 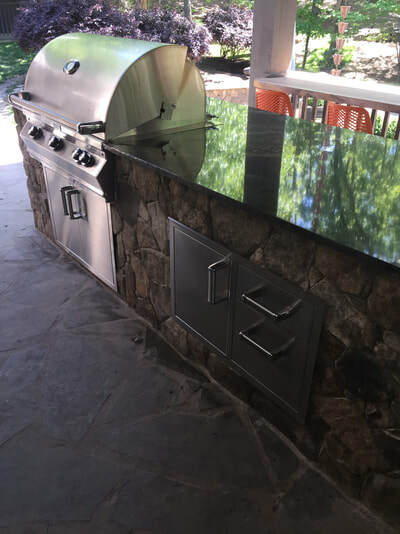 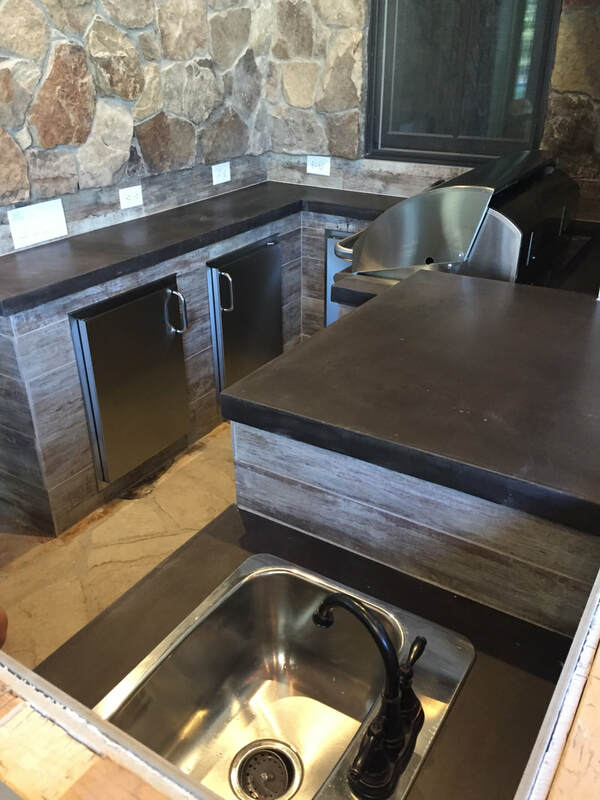 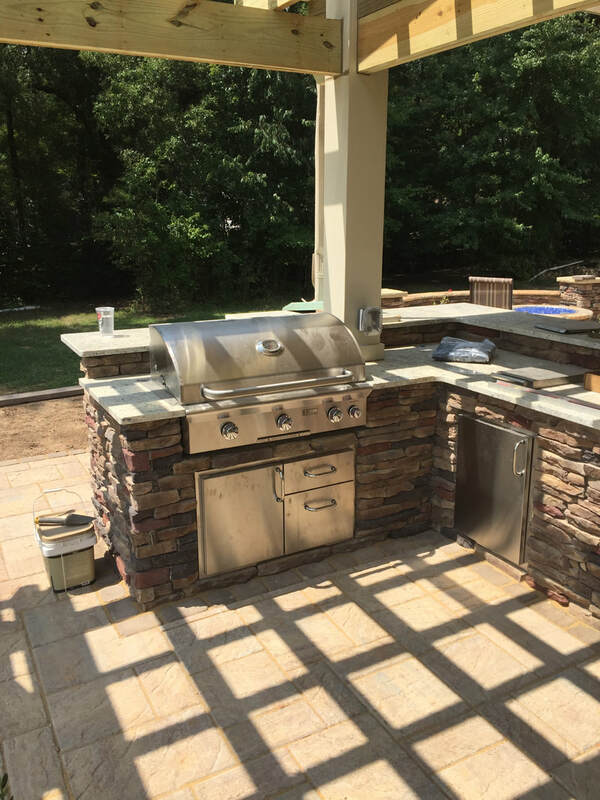 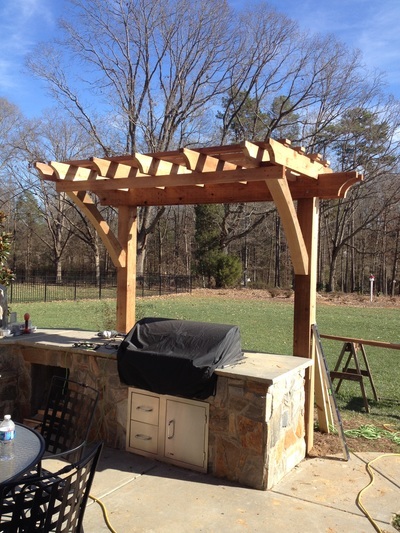 As you can see by many of these pictures, we can provide all of the supporting items needed to complete the perfect outdoor kitchen. 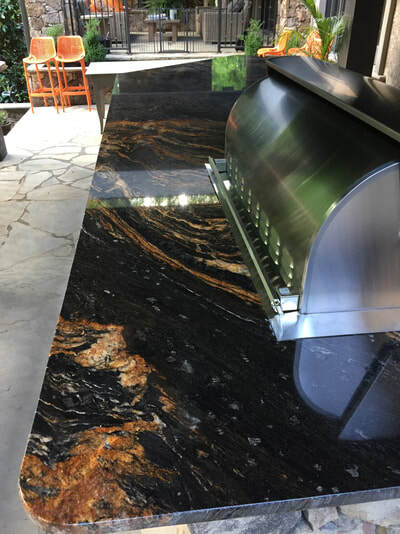 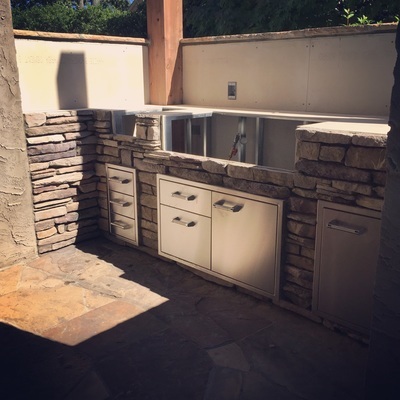 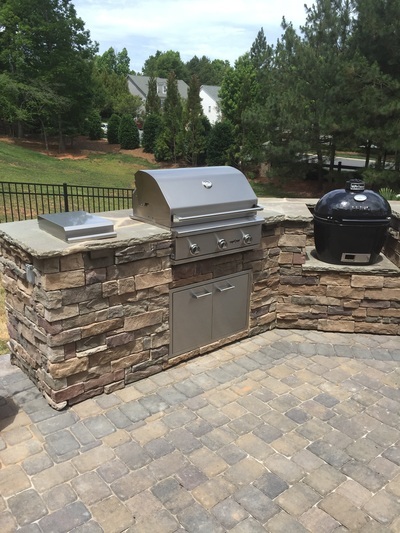 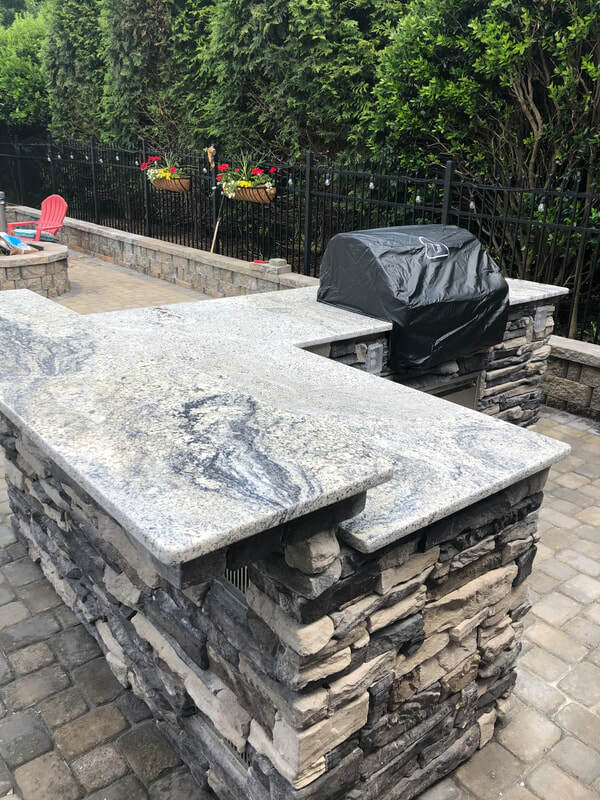 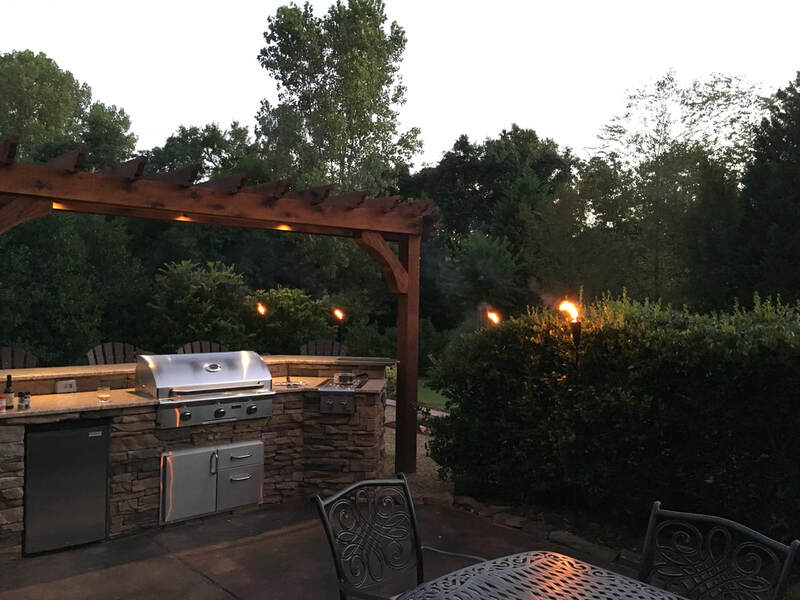 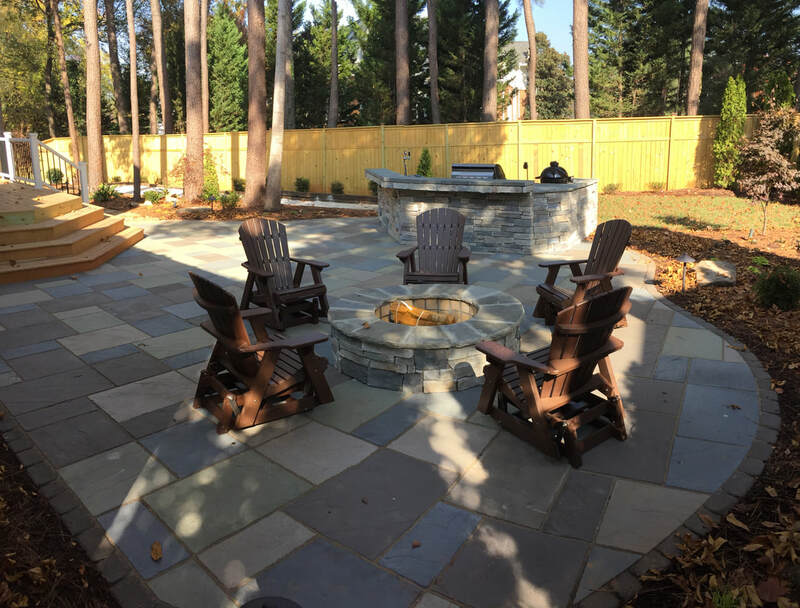 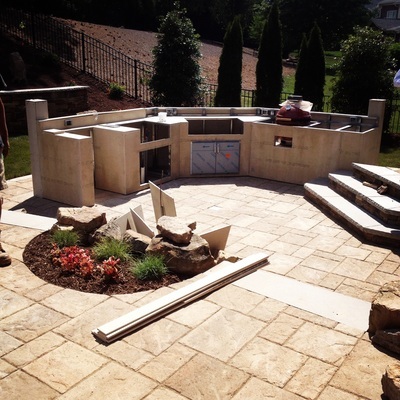 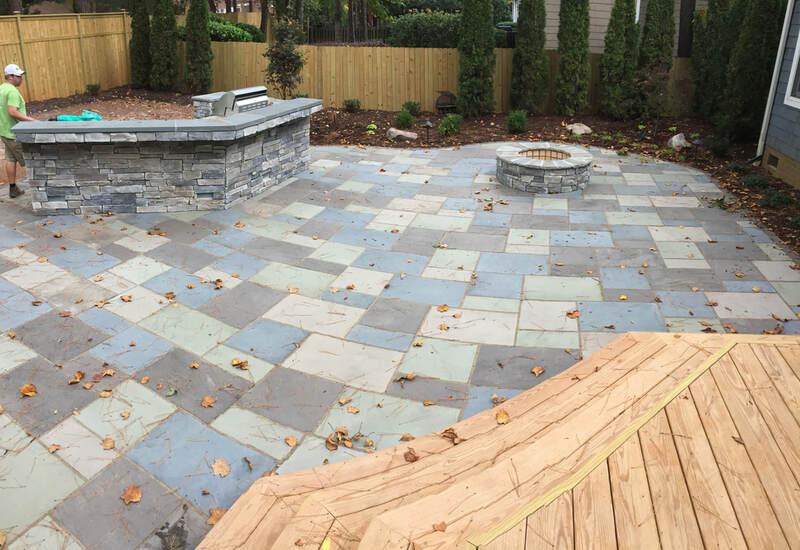 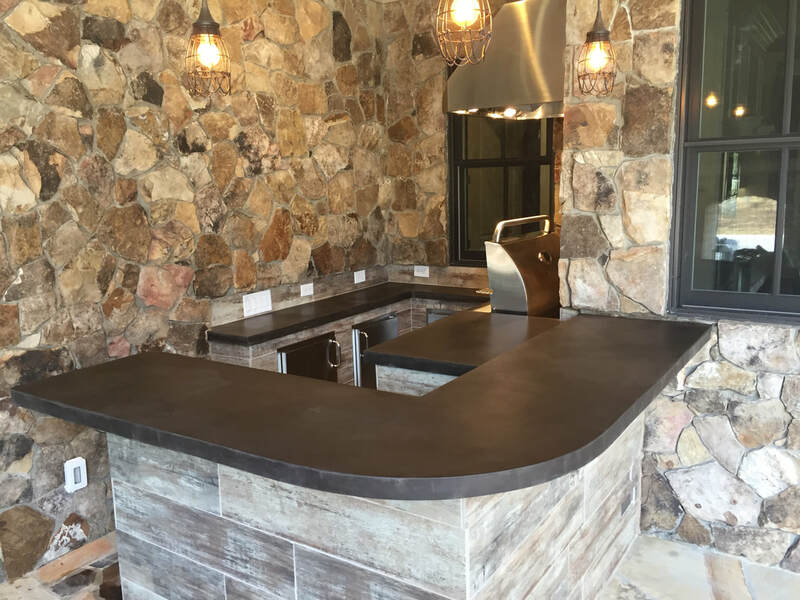 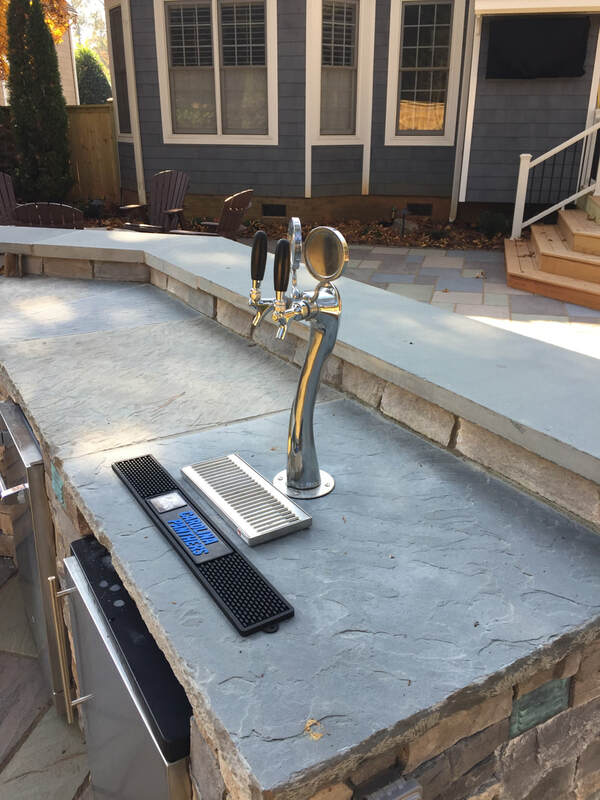 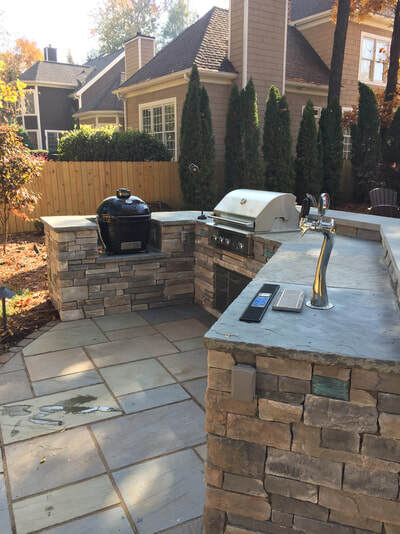 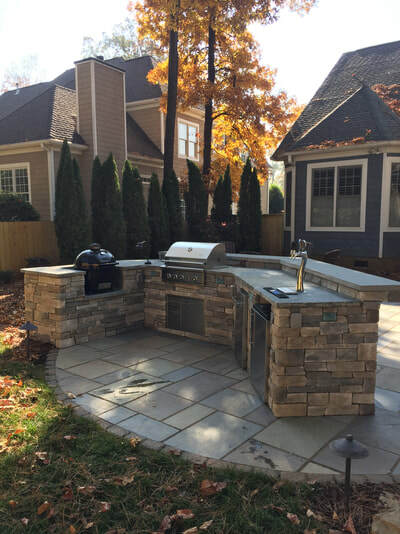 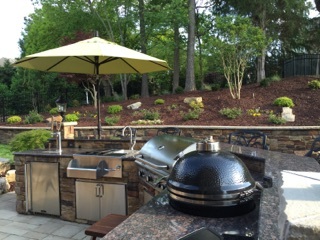 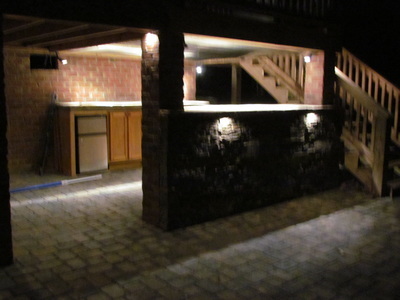 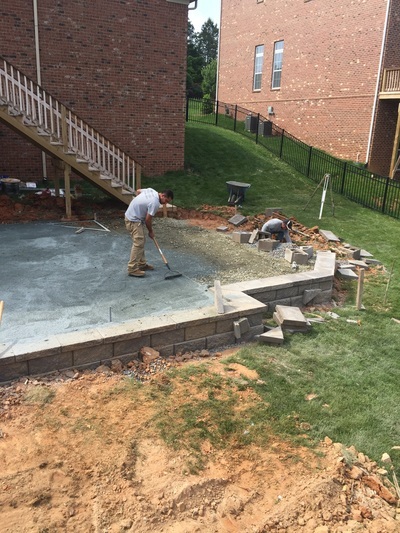 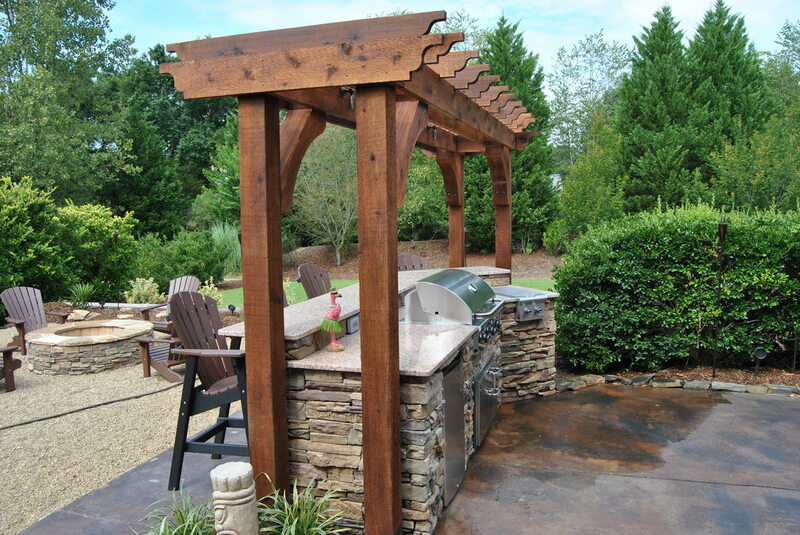 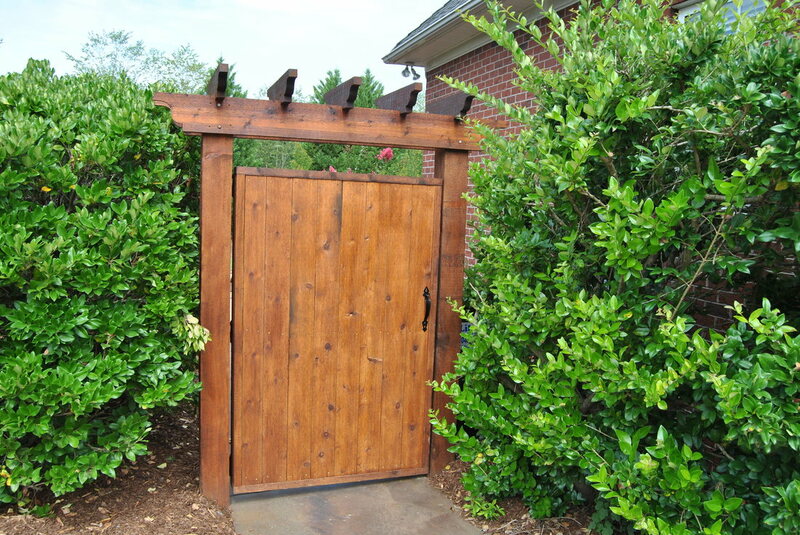 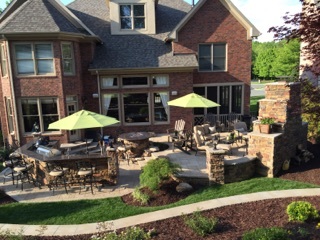 Since there are very few custom outdoor kitchens installed on the grass in your back yard, we provide our clients with the design /build capabilities to include patios, walkways, walls, steps, proper drainage, landscape lighting, fire features and softscaping. 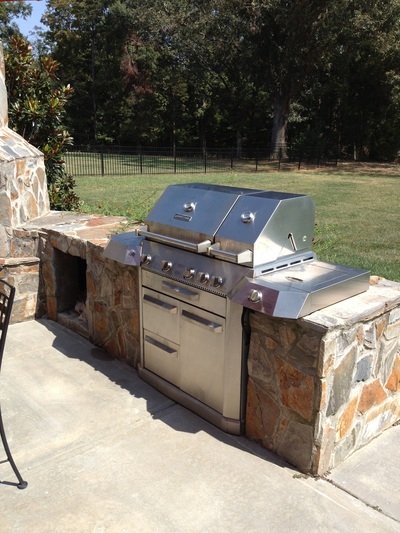 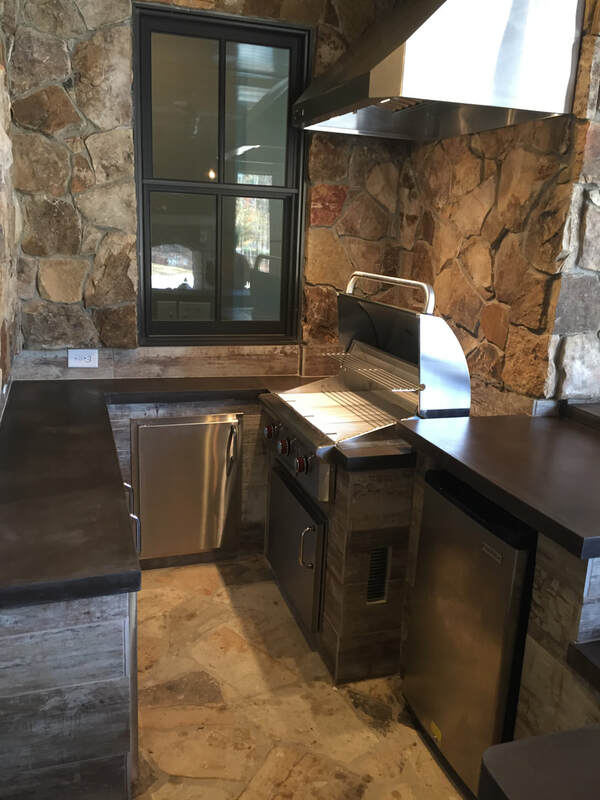 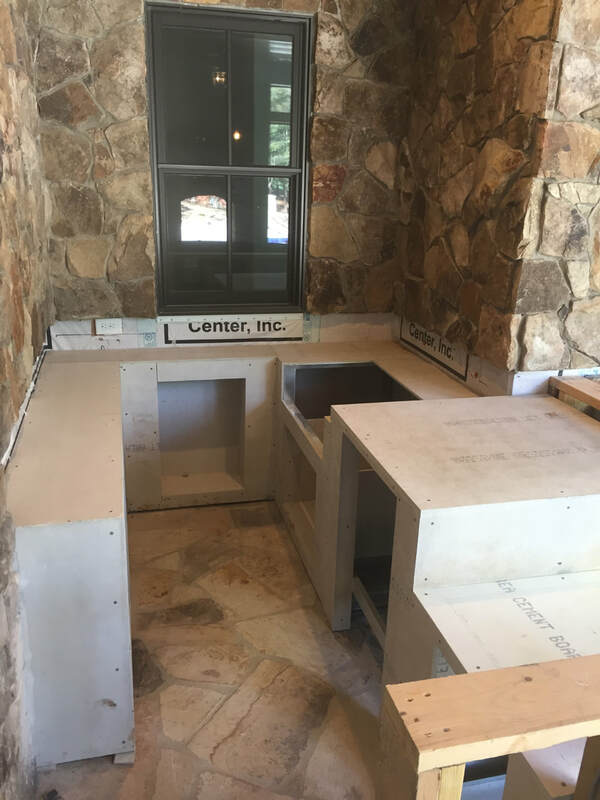 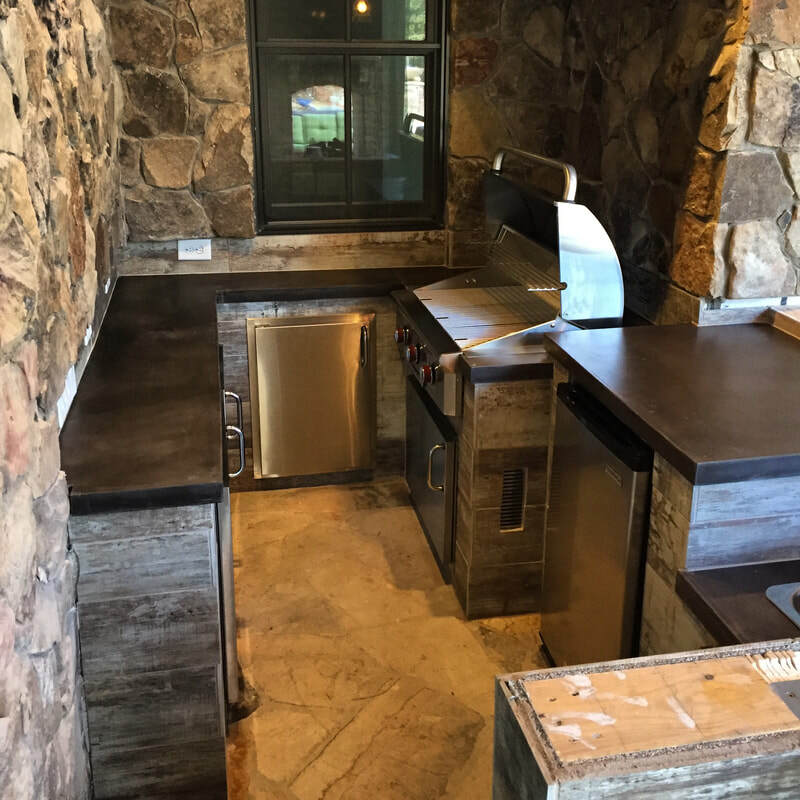 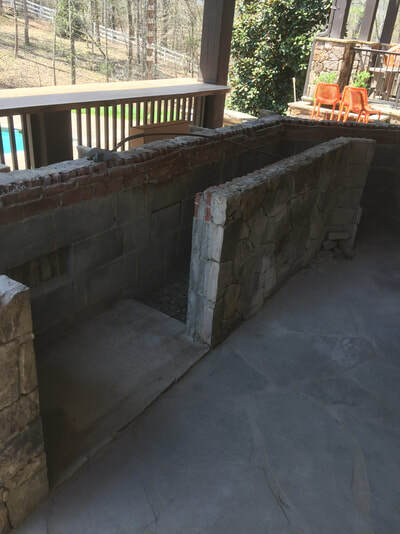 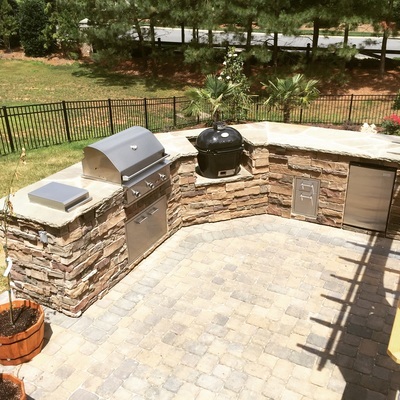 This Waxhaw, NC outdoor kitchen renovation included removing the existing flagstone counter, adding vents, new Fire magic grill, double doors, new fridge and a door/ 2 drawer combo unit. 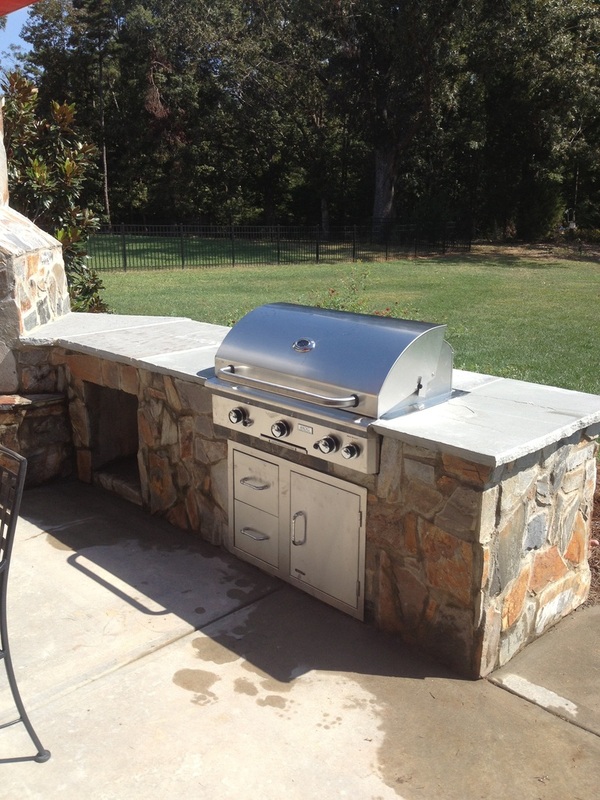 The client then added a new granite counter and a vent hood. 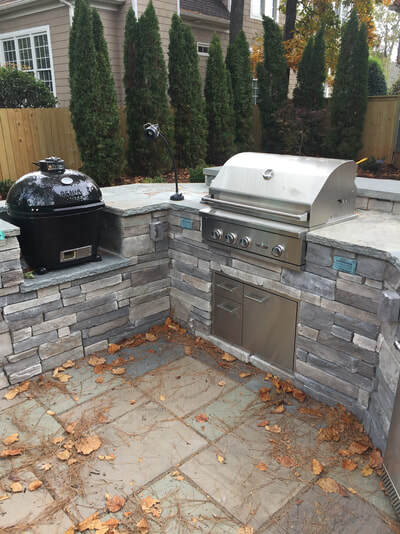 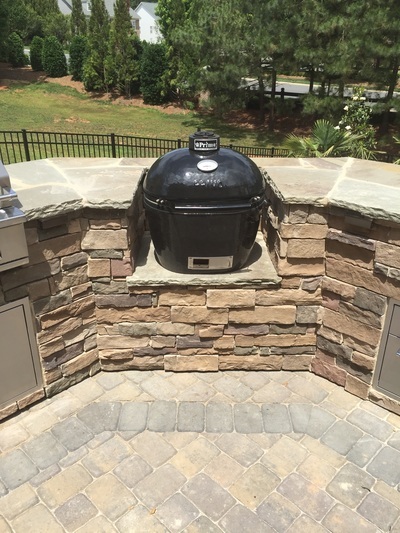 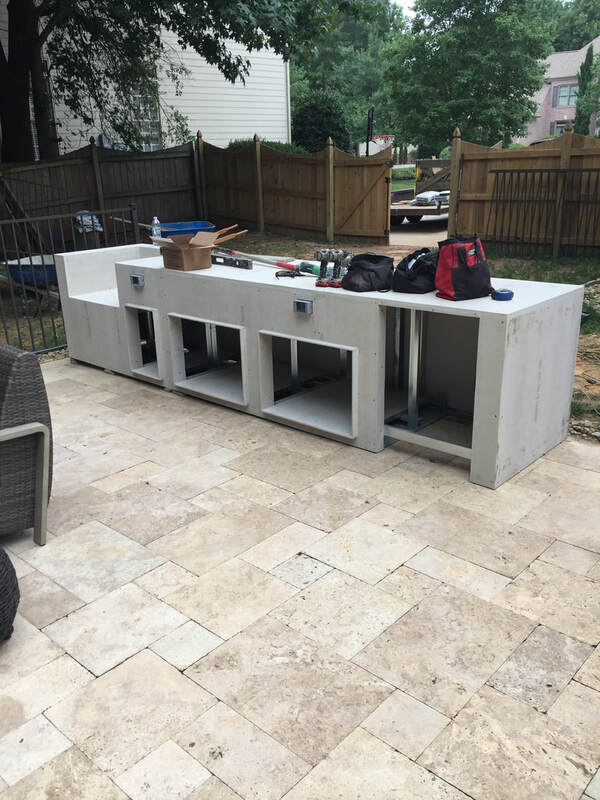 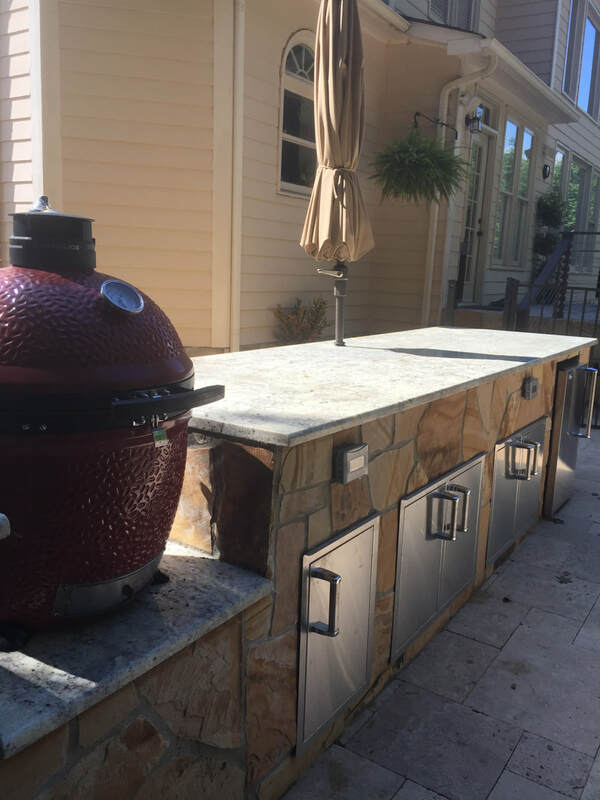 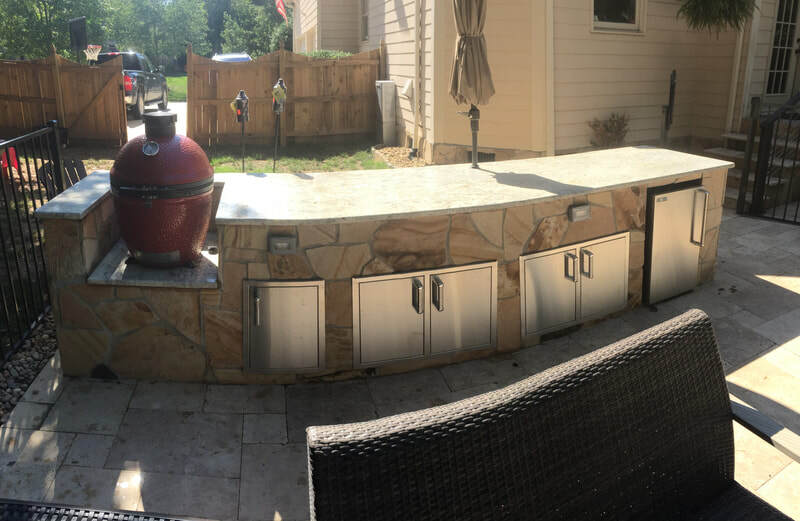 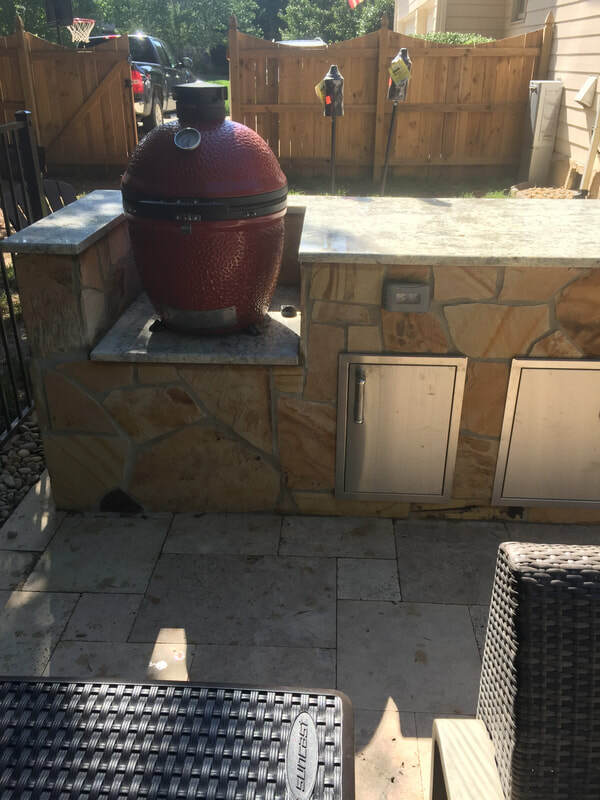 For this project, the client wanted to have plenty of counter space in addition to an area for his Kamado Joe smoker. We also added an outdoor refrigerator and plenty of Fire Magic soft close door and drawers. 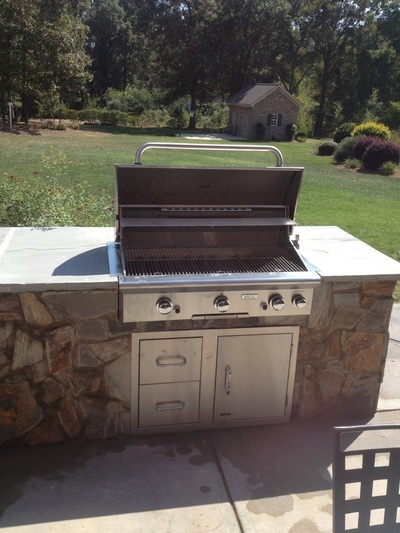 CHARLOTTE GRILL ISLAND WITH CUSTOM SMOKER!! 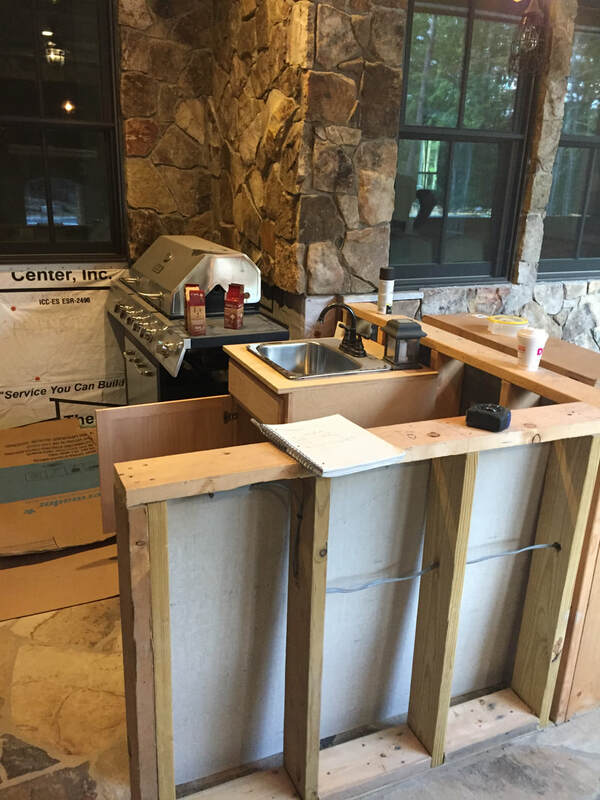 As you can see in the pictures, this custom island features a smoker box that the client designed. 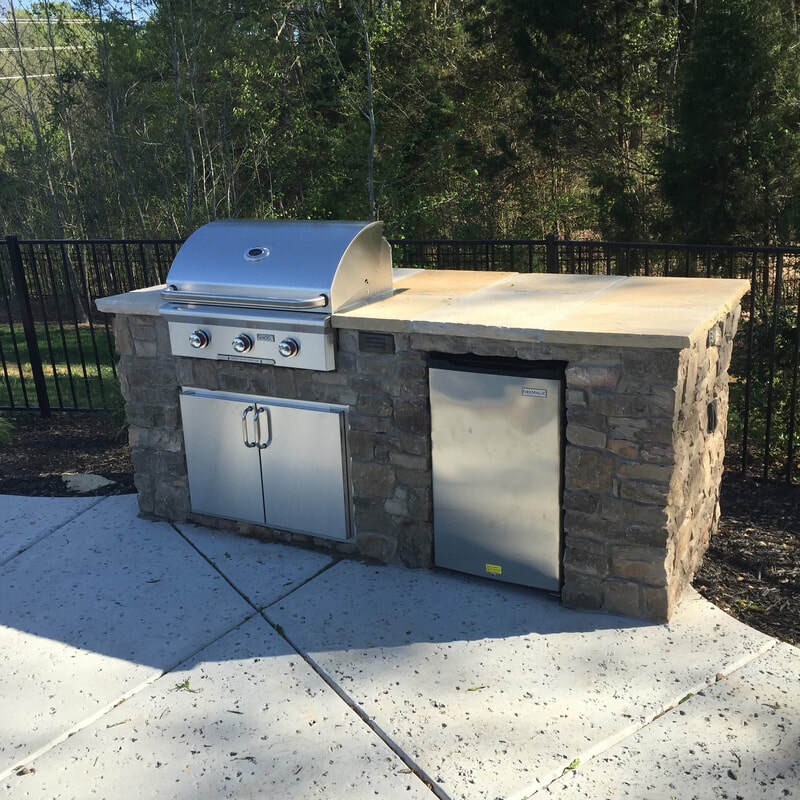 When asked if we could build it, there was never a doubt! 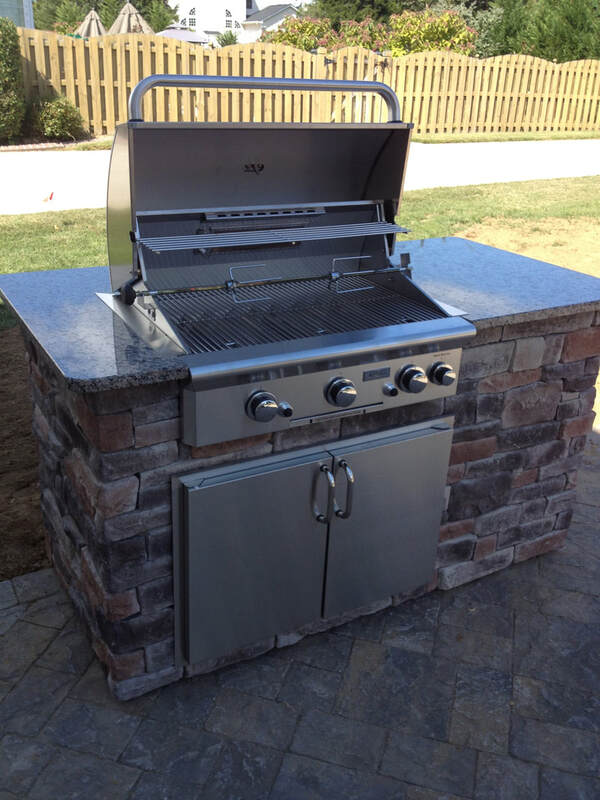 We love a nice challenging custom project. 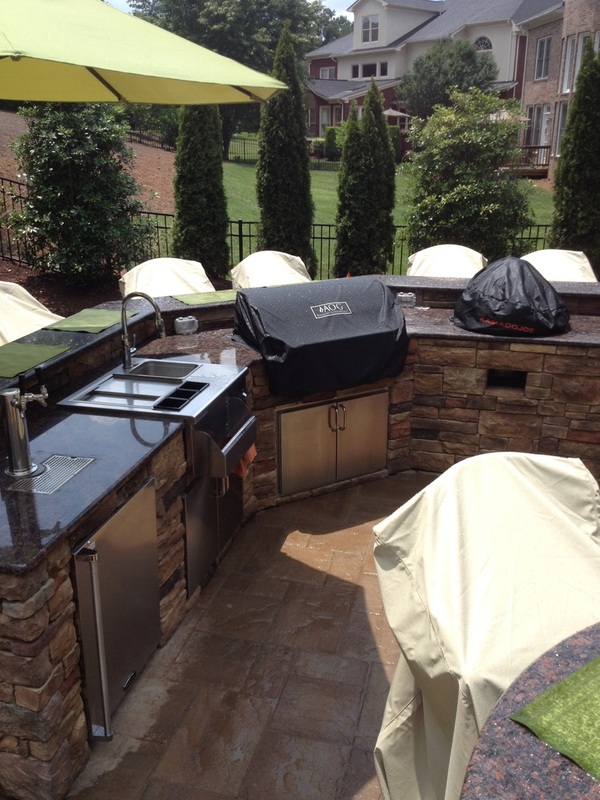 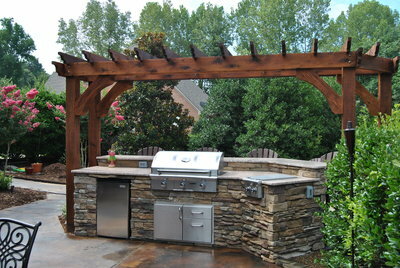 Charlotte, NC outdoor kitchen project proposed for this area. The small wall will be removed to make room for the new outfoor kitchen island. 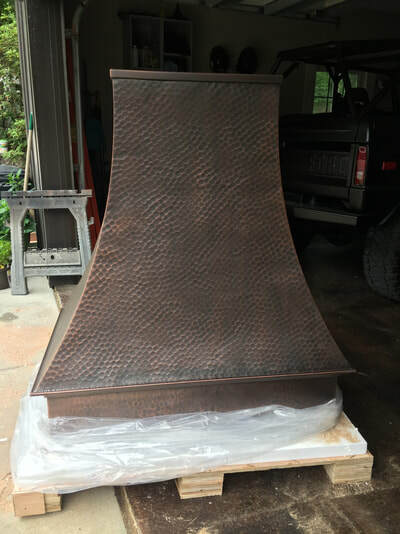 This is a picture of the wood stove door assembly that will be used to make the custom wood smoker. 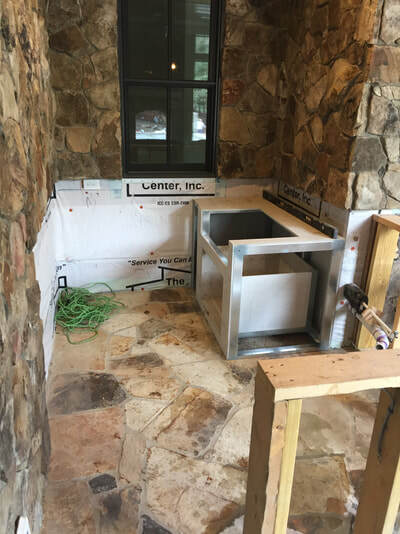 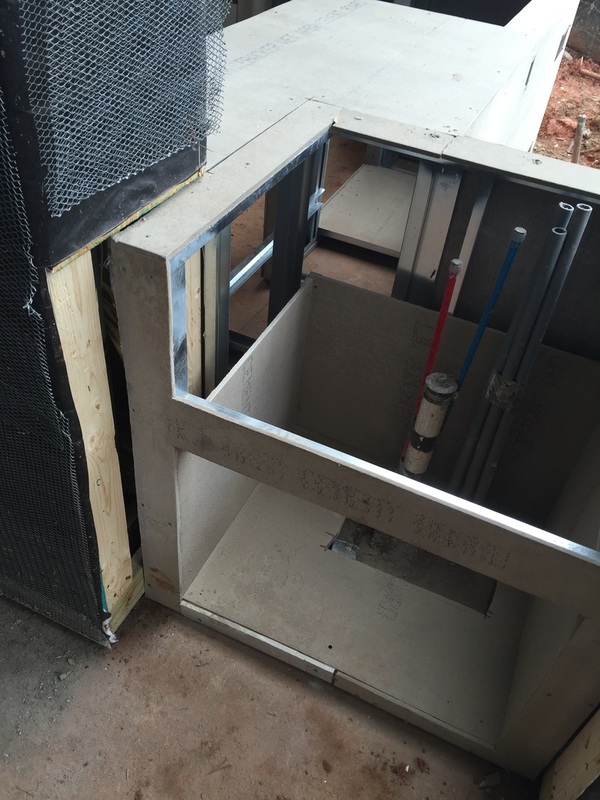 The installation of the ceramic flue liner completed the lower section of the custom smoker box. Now we will modify the 24" AOG gas grill to sit on top of the flue liner. 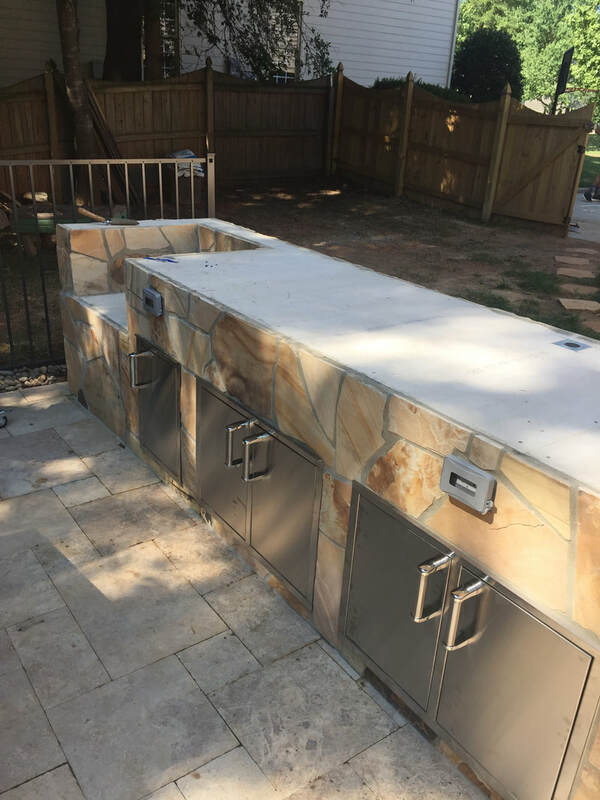 Doors were removed and new handles were made. 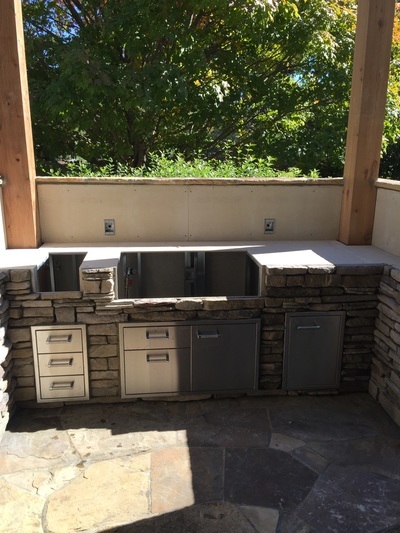 Fully functional sink, natural gas for grill and side burner & electric lines all run by others once the stonework was complete. 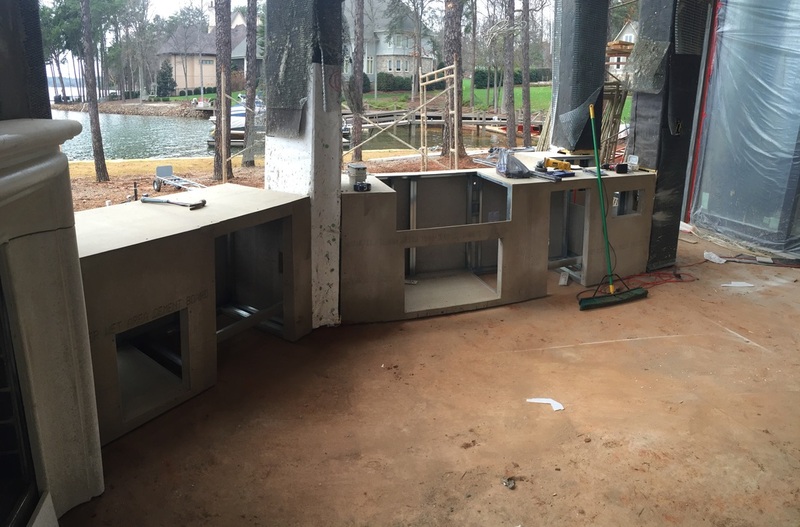 Kitchen island frame has been installed and leveled. 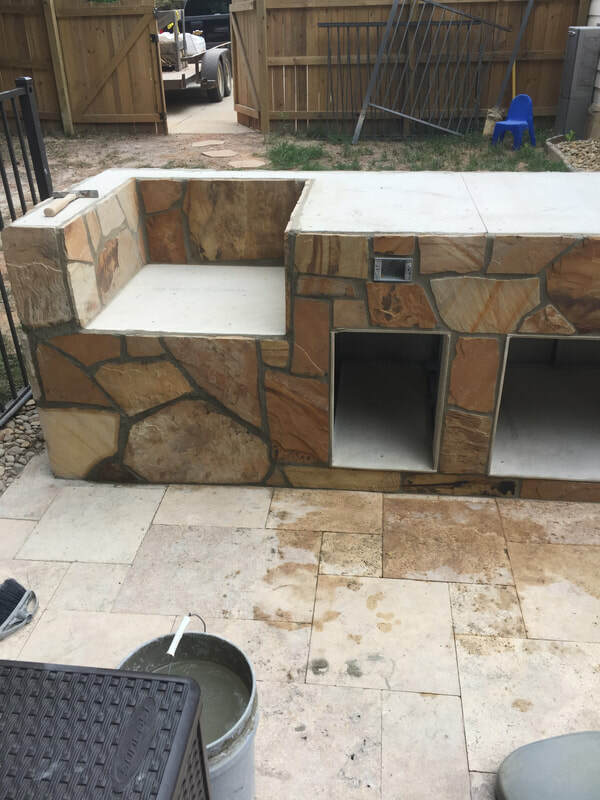 Now ready for stone then granite. 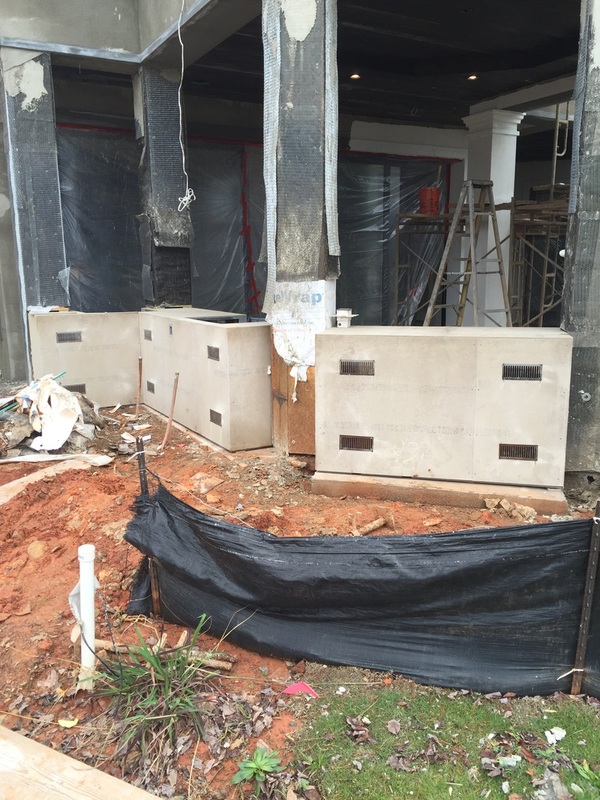 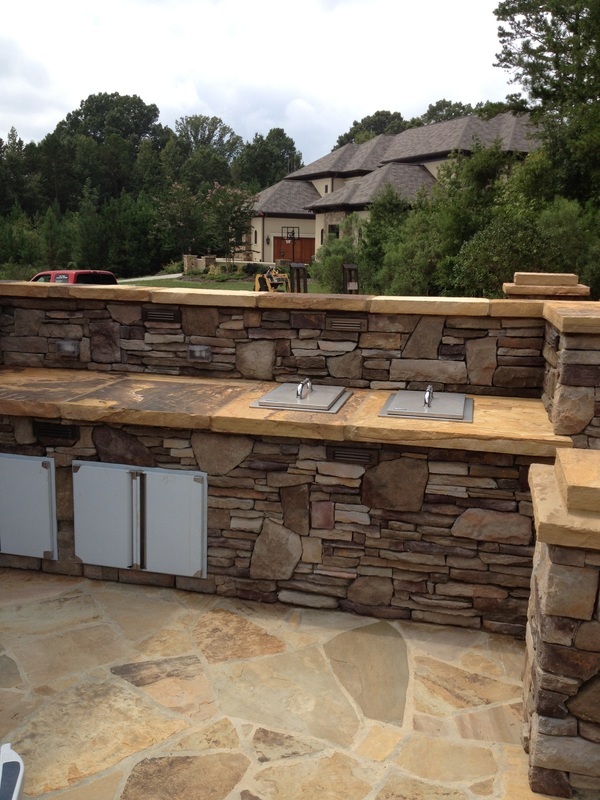 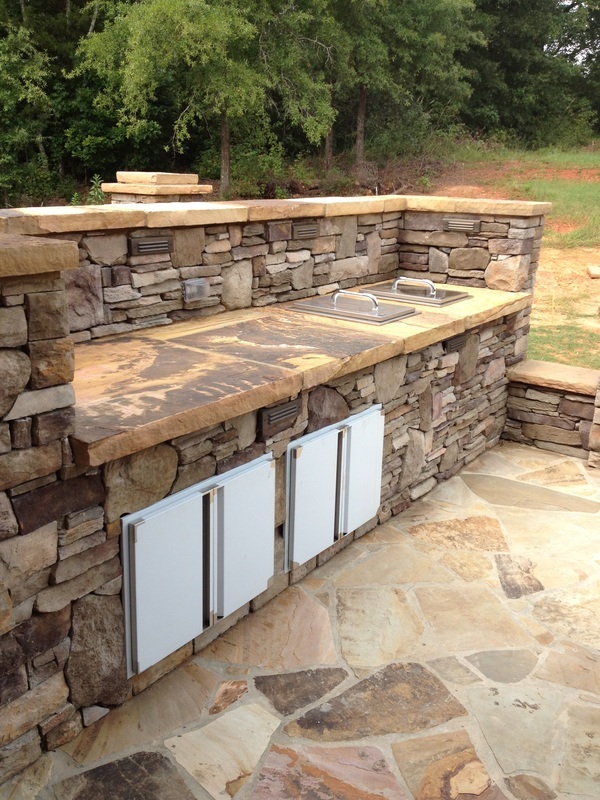 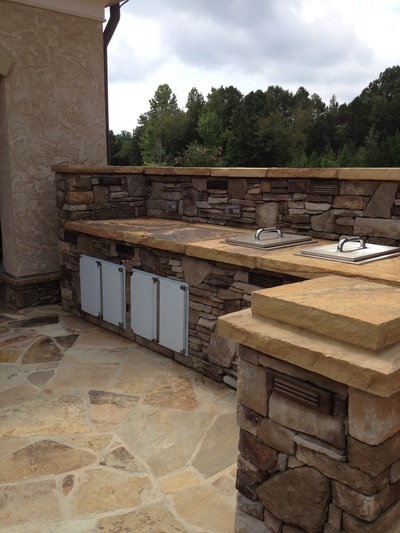 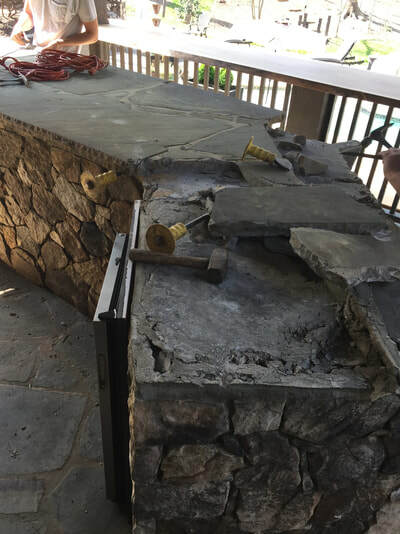 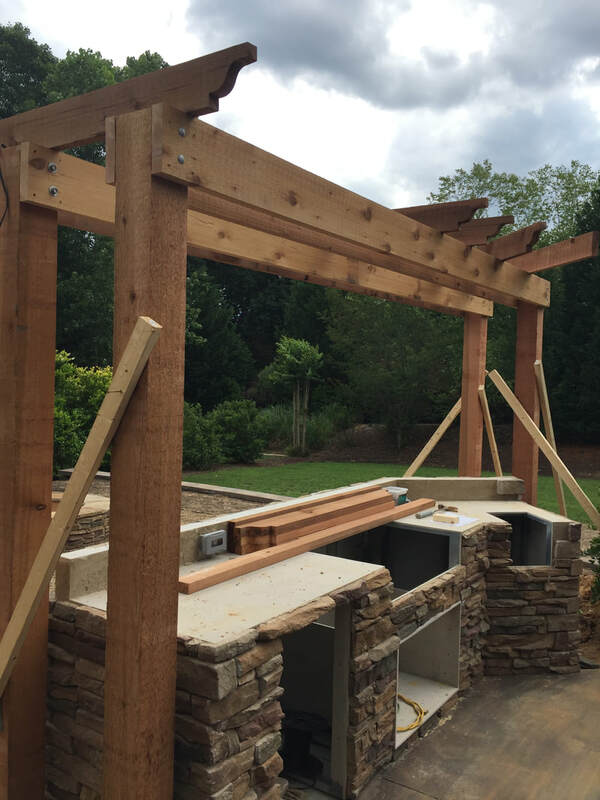 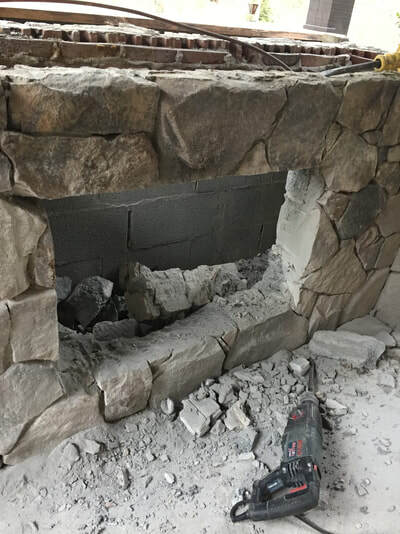 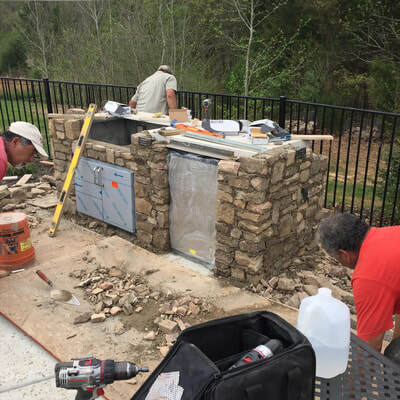 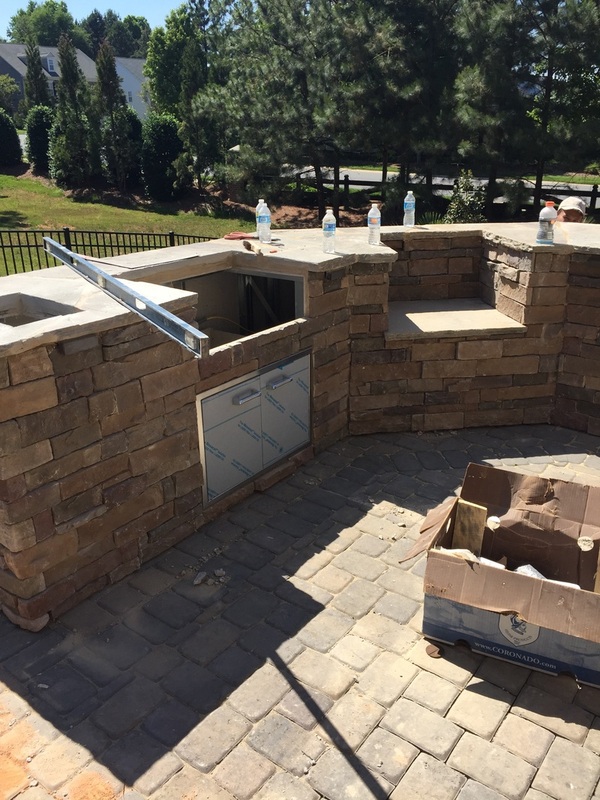 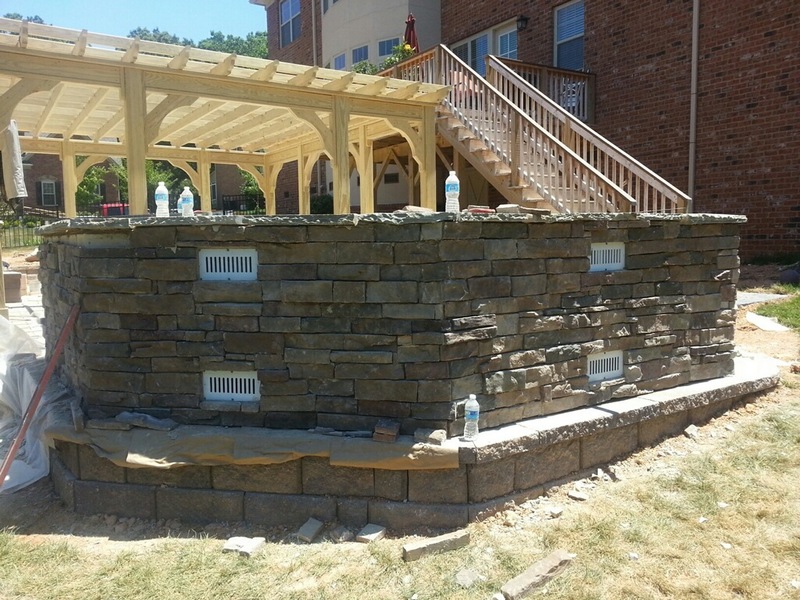 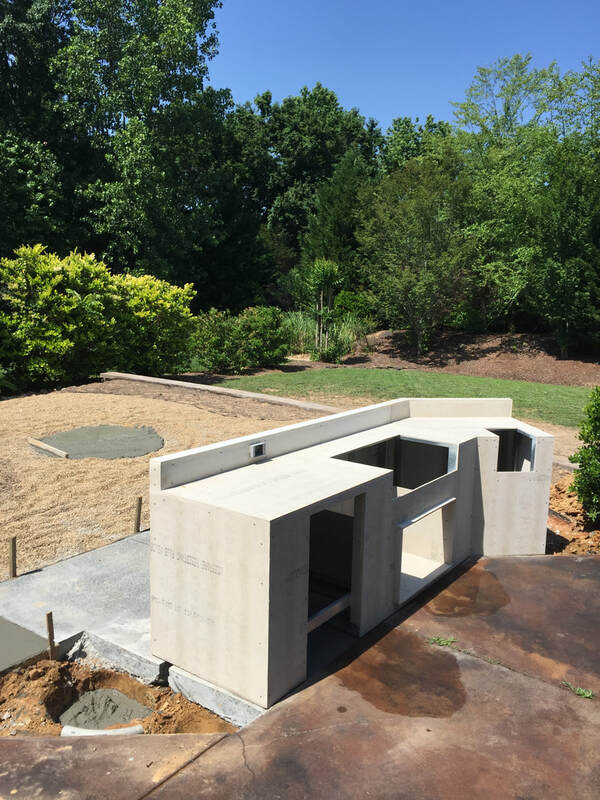 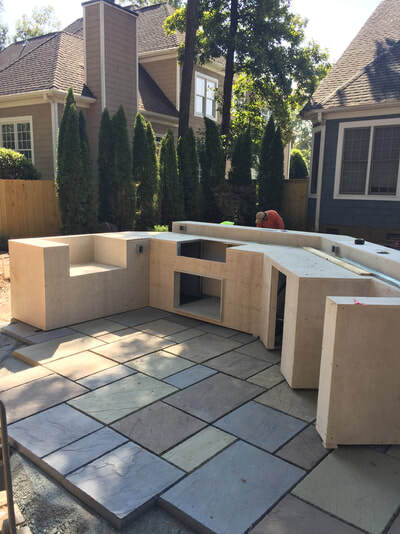 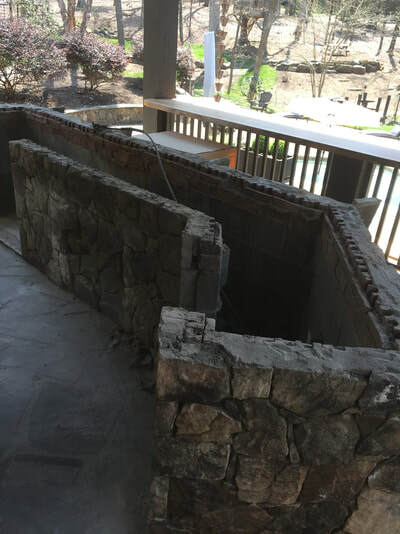 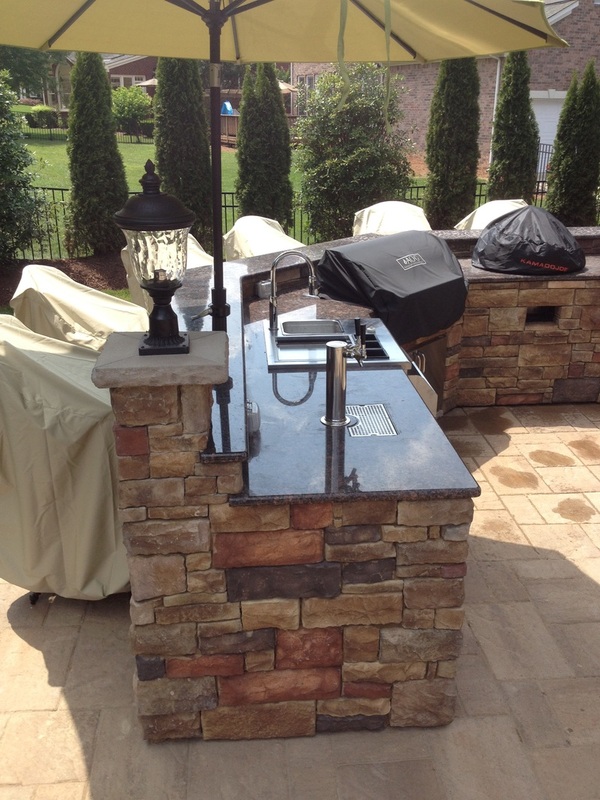 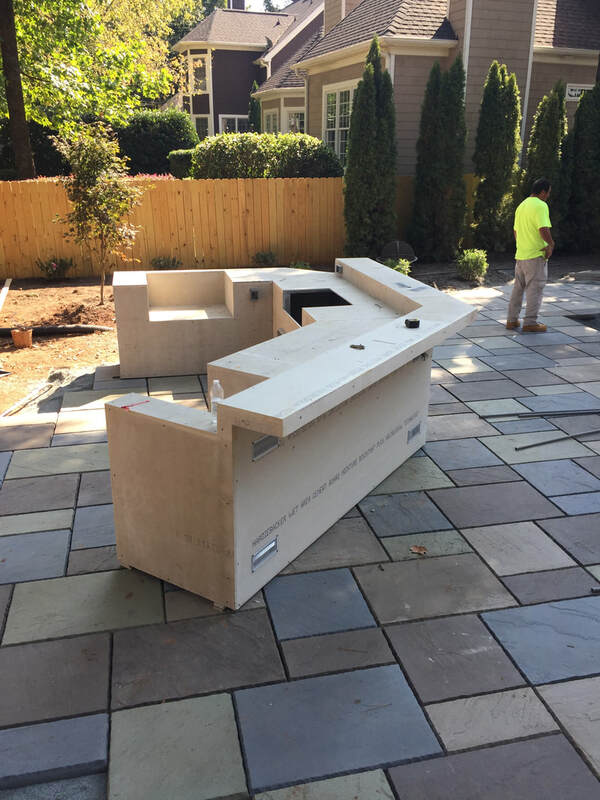 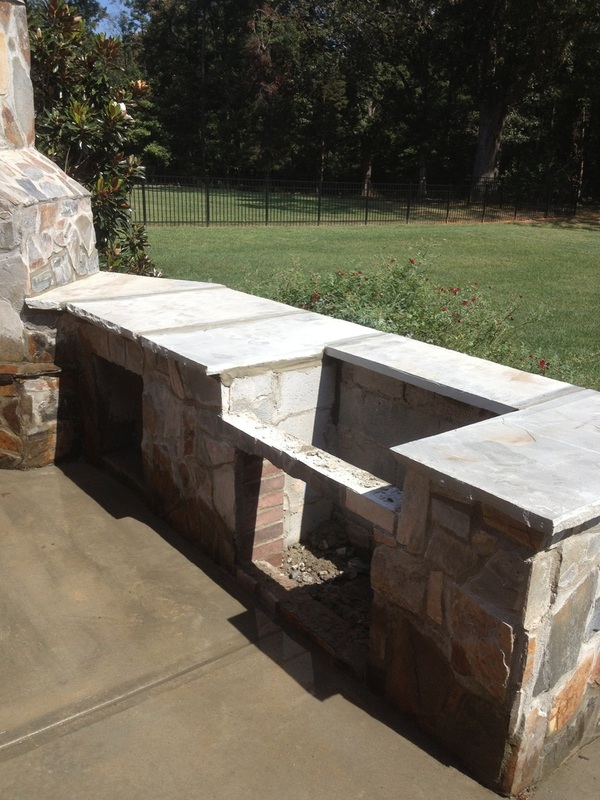 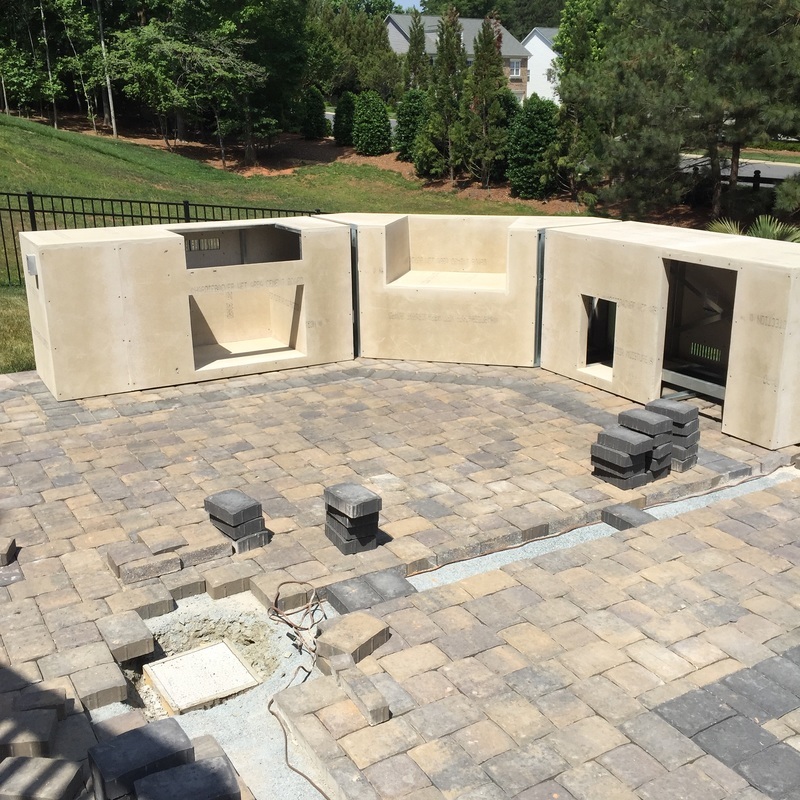 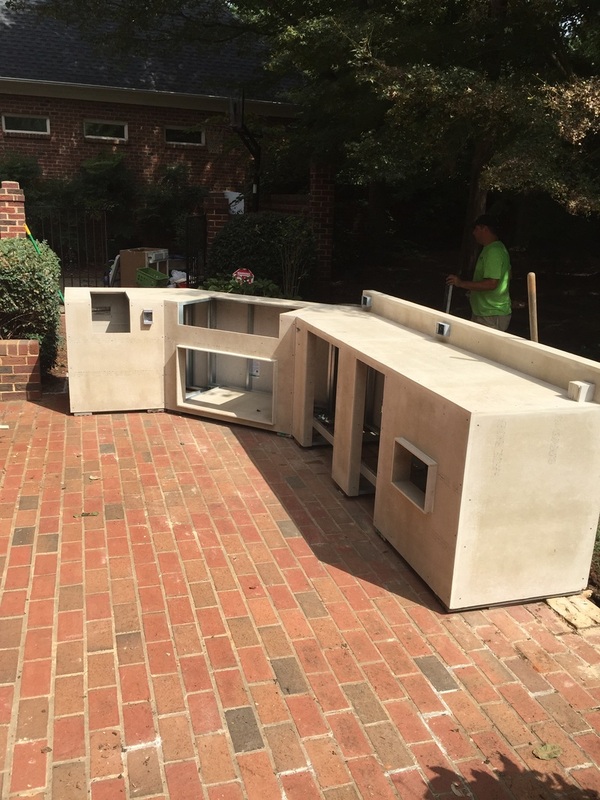 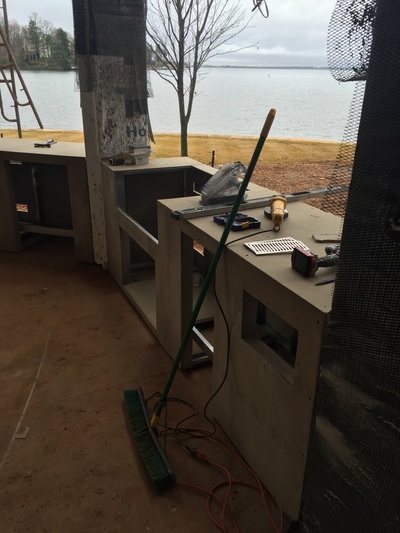 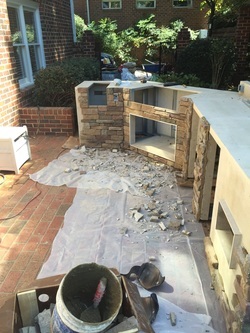 Stone installation for this Charlotte, NC outdoor kitchen project. This will feature 2 AOG gas grills, one which will be used as part of a custom smoker box. 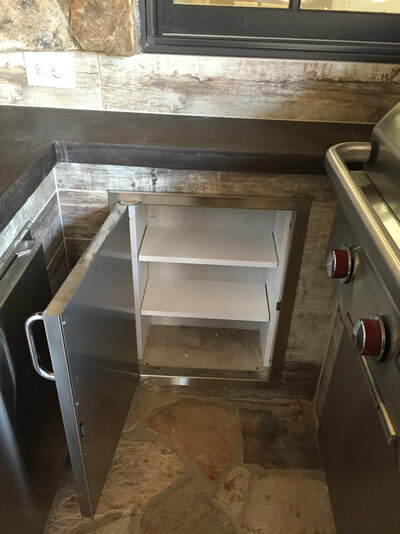 We need to custom fabricate a smoker box and needed a really sturdy option for the doors, which also needed to have adjustable vents. This is the wood stove we purchased and has the door assembly removed. 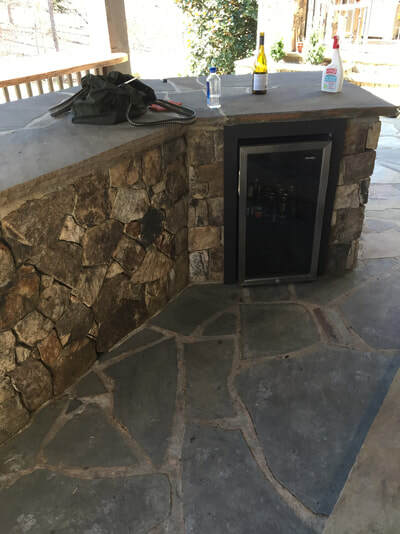 The smoker box is lined with firebrick after the door assembly is installed. 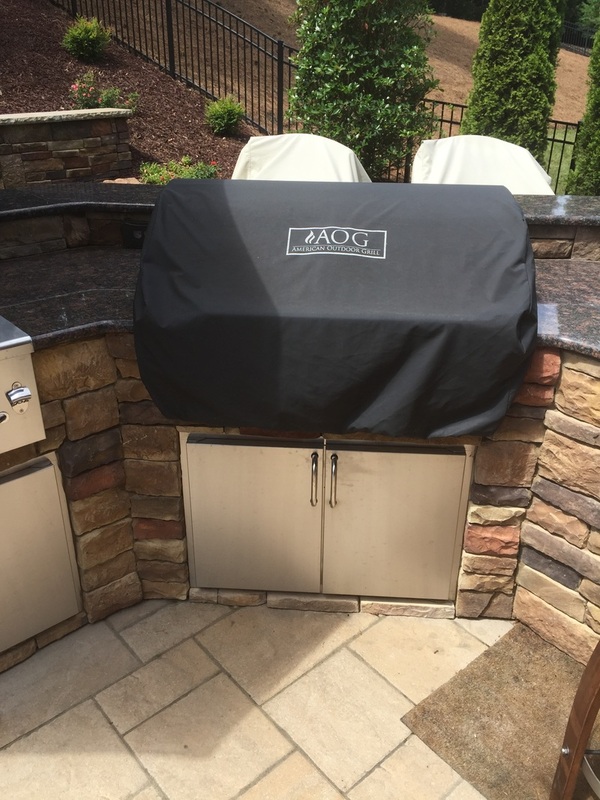 Finished outdoor kitchen with AOG gas grill, Delta Heat doors / drawers. 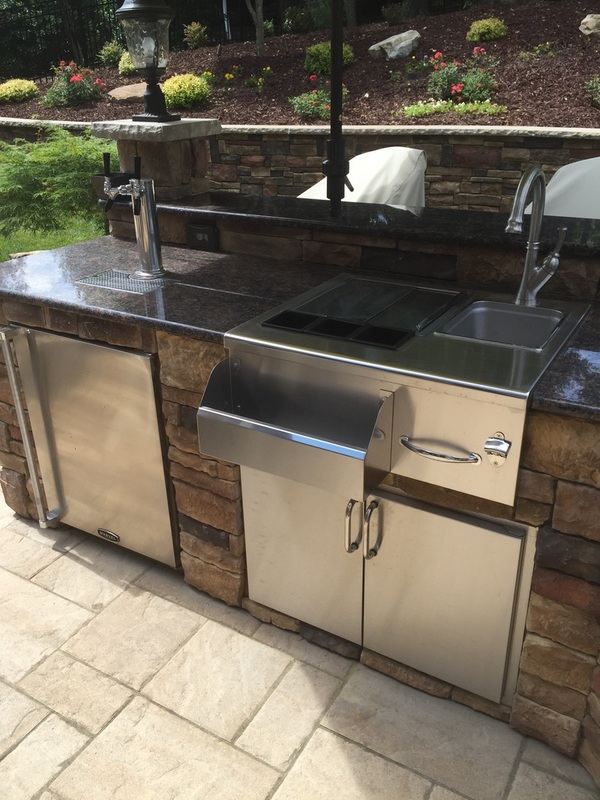 Sink, ice maker and outdoor refrigerator purchased by client. For this outdoor kitchen island, the client already had all utilities run to the proposed island location. The area was a little tight which provided us with a nice challenge to fit all of the counters, doors and appliances. 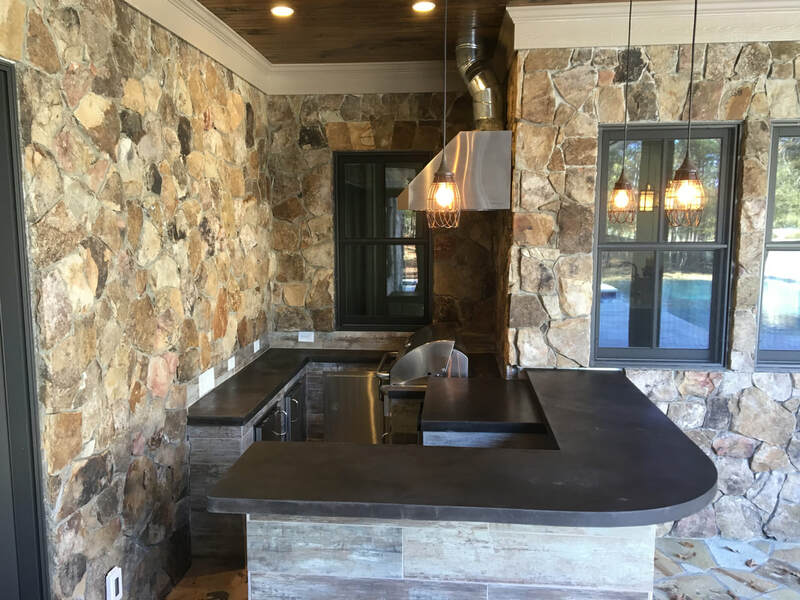 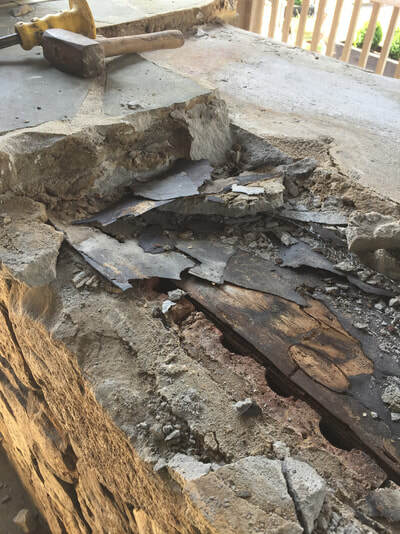 The client had purchased a porcelain tile which resembled an old barnboard and the countertops were constructed from concrete. Carolina Custom Countertops manufactured and installed the tops.